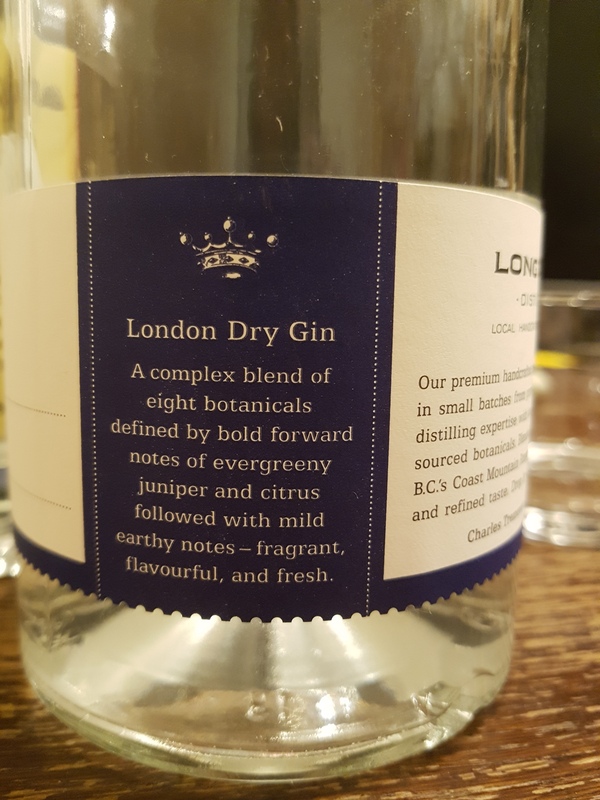 london dry gin | Justintoxicated. All right 2018, let’s do this! 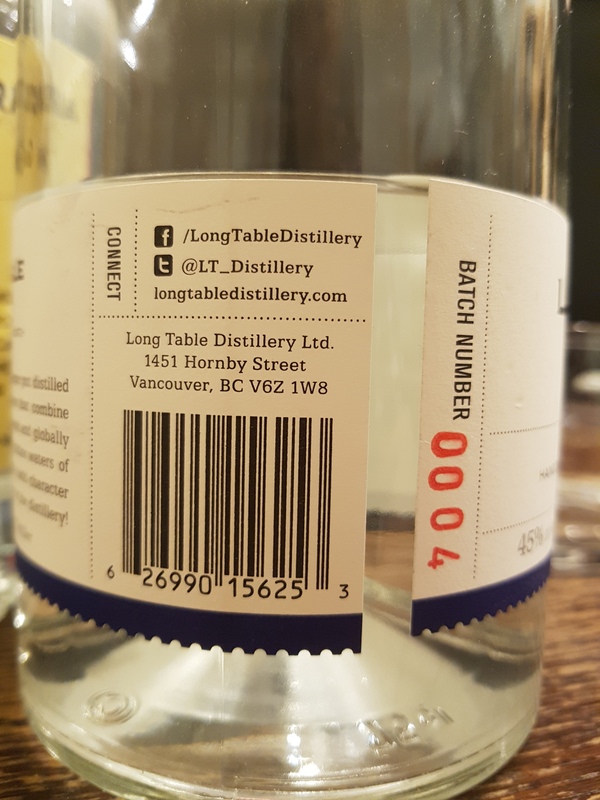 In round 5 of the gin battle we have the 2017 winner Victoria up against the local Long Table located in downtown Vancouver. Both weighing in at 45% ABV and Victoria made with 2 more botanicals than Long Table, which one will dominate the taste buds? Let’s do this, guy. Nose: VG has a medium cleanliness with flavours of juniper and bright citrus emerging from the detectable alcohol. LT is duller with rounded edges, slightly creamy with grassier notes. The LT alcohol detection is much more apparent with just a bit of harshness on the nose. Although VG comes across as slightly soapy, VG is the winner. Taste & Texture: VG, upon the first sip, the beautifully aromatic star anise jumps out, fruity juniper in the mids with strong citrus overtones backing it up until the finish. LT despite being a London Dry style, surprisingly comes across as sweeter up front, thicker viscosity, muddly grassy juniper, licorice-coriander alcohol numbing mids, mild cinnamon, citrus undertones, slight nutty – almost salty finish. LT displays a pleasant balanced roundness. In terms of explicit and distinguishable flavour, Victoria takes the cake. VG wins. 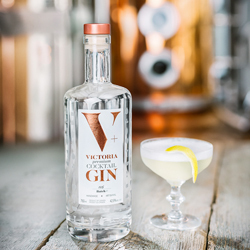 Victoria Gin is much brighter, thinner in mouthfeel, soapier, has a bit more roughness, but is overall has and displays strong notes of star anise and orange citrus. Verdict: Victoria Gin is my preference and winner. 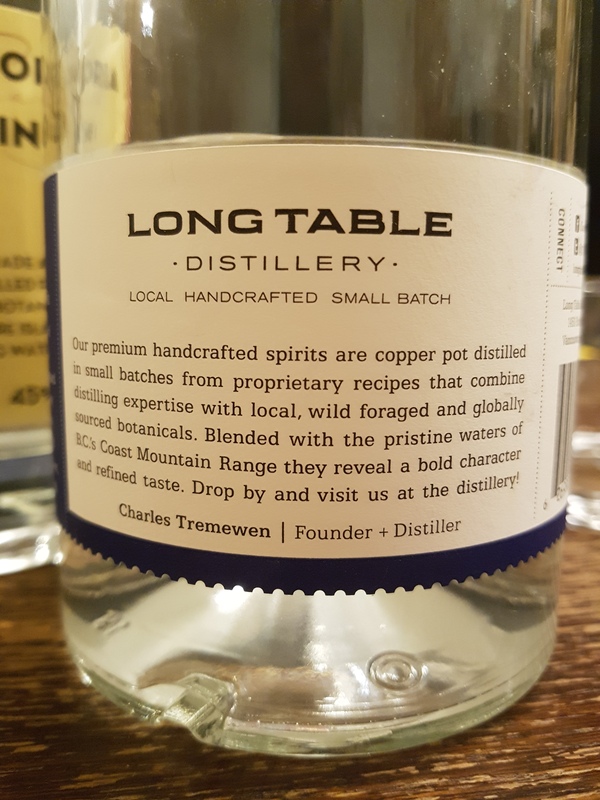 Nevertheless Long Table London Dry Gin is quality gin but it doesn’t have any standout flavours despite being balanced. Let’s kick off the start of a new year by welcoming the 7th Round of the London Dry Gin Battles. 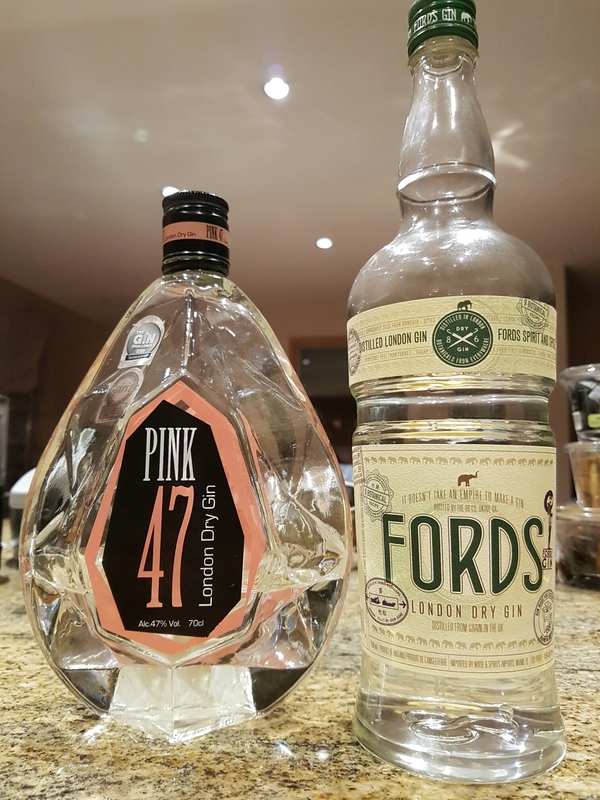 We have the newly crowned Pink 47 going up against The 86 Co.’s Fords London dry. 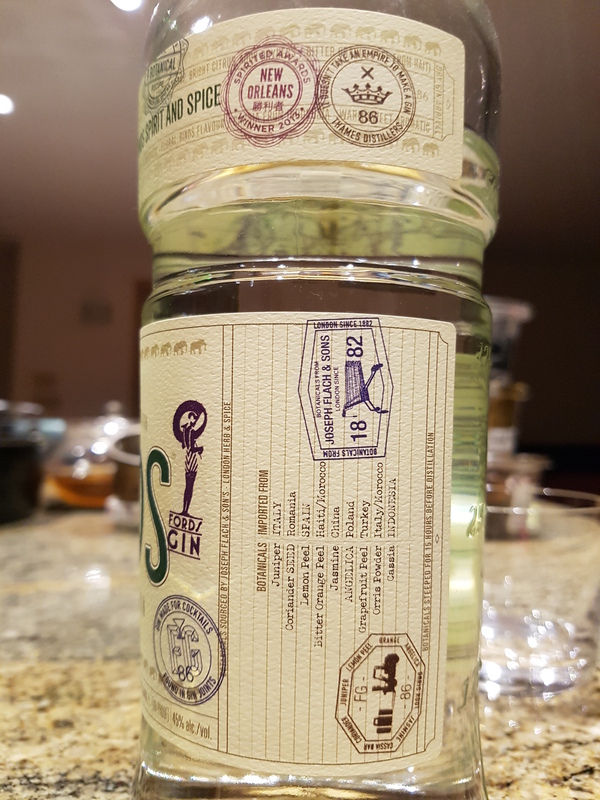 distilled by 8th gen Master distiller Charles Maxwell and Simon Ford of The 86 Co. Nose: Keeping in mind that almond, licorice, and nutmeg differ in ingredients for P47, I get half juniper-half licorice floral harshness. While it’s not exactly unpleasant, I find the alcohol detection slightly disengaging. Fords main difference is its use of grapefruit peel and jasmine. Upon nosing Fords I get a very clean, composed and mellow sweet grapefruit-lemon citrus – virtually no nasal burn whatsoever; Impressive since it is just 2% ABV lower. 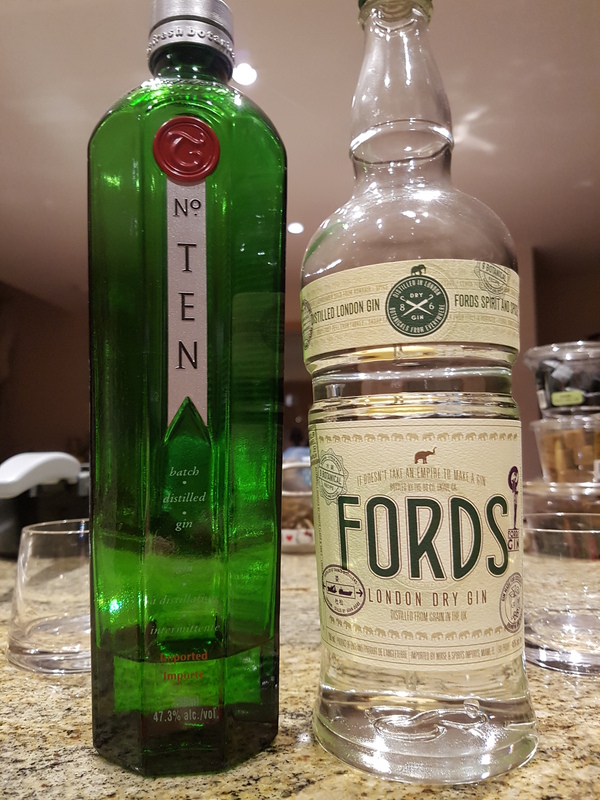 Fords wins the nosing challenge. Taste & Texture: Sipping P47 for the first time in 2017, I remember why I dethroned T.10 in round 6. It comes out with a huge alcoholic intensity backup up by a very lengthy sweet juniper base, prickly licorice and subtle citrus mids, and incredible throat heat at the finish. My intuition says that this will make a sturdy gin base in a cocktail. Onto Fords, slightly thicker in viscosity and wow, I’m really digging the juniper/cinnamon->grapefruit-lemon-orange->sleeper jasmine notes at the finish. Amazingly the alcohol harshness stays for the most part, hidden in the background so you are able to concentrate on teasing apart the individual botanicals. Although P47 has intensity and length, Fords takes it with its composed clean elegance. Both have their place when concocting cocktails; P47 for cocktails with numerous ingredients, Fords to accentuate either the citrus or spotlight the jasmine in it. Outcome: T.10 grapefruit/lime/orange/chamomile VS Fords grapefruit/lemon/orange/jasmine = T.10 is much more grapefruity citrus forward but with it comes a lot of aggressive alcohol at 47.3% ABV. It’s quite suitable in a lower ABV cocktail. 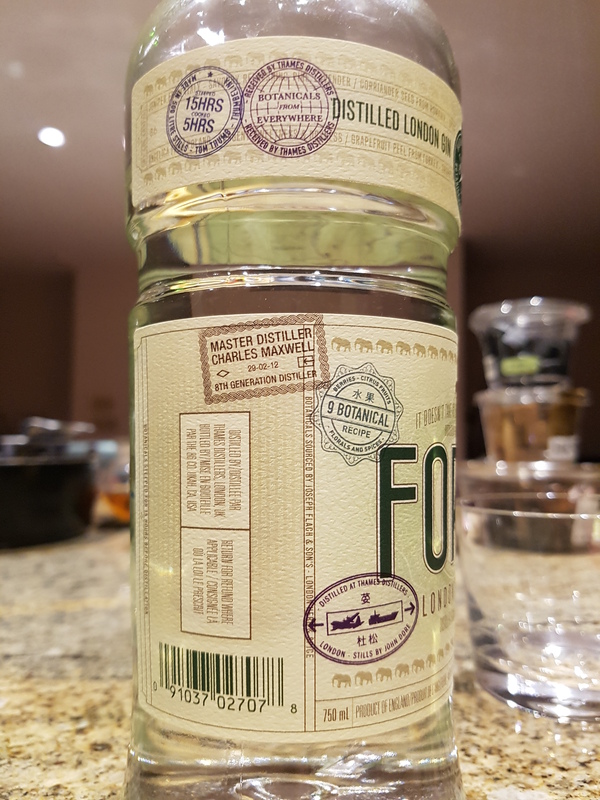 Fords is much more tame and around a 65:35 – juniper:citrus ratio. I’d pick T.10 but obviously only for citrus-oriented gin cocktails. 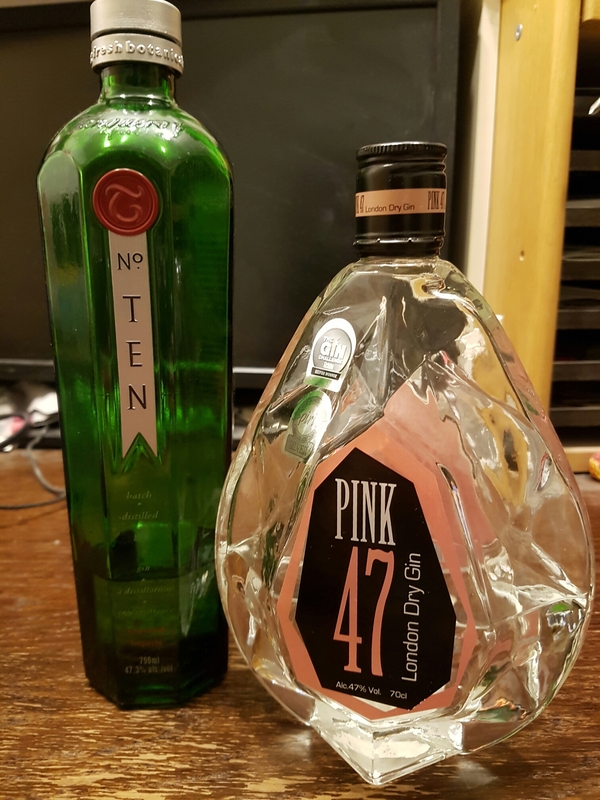 Tonight makes it Round 5 of the Gin VS challenge and this time we have the previous rounds new title holder Tanqueray 10 up against an virtually equal ABV’d Pink 47. Let the Gin battle begin! recipe also includes use of fresh citrus fruits, including: white grapefruit, lime, orange, as well as chamomile flowers. Nose: Starting off with T.10, the base grain spirit immediately jumps out with the ethyl alcohol and partial soapiness. It doesn’t have a ton of aroma with it, only a bit of citrus oil in the background. P47 noses quite similarly with the alcohol detection but is backed up by juniper notes, some rootiness, and significantly more nasal burn. Bottom line, T.10 = sweeter, muted alcohol. P47 = harsh alcohol detection. Tanqueray No.10 wins the aroma test. Taste & Texture: T.10 first, it is slightly thicker in viscosity while the tongue gets coated with ctirus oils. A big grapefruit burst grabs your attention followed by juniper, and then the lime/orange oils. There’s a slight prickly sensation as well, and then comes the lasting throat warmth. Lingering bitter citrus oils at the finish. On to the P47, it feels noticeably thinner in the mouth than T.10, big juniper flavour from the get go, some citrus in the mids, cassia and coriander in finish. The flavour is quite full but the alcohol is also harsher. Subsequent sips numb the tip of the tongue. Bottom line, although I appreciate the big flavour of P47, Tanqueray No.10 is silkier in texture and better in smooth flavour delivery. 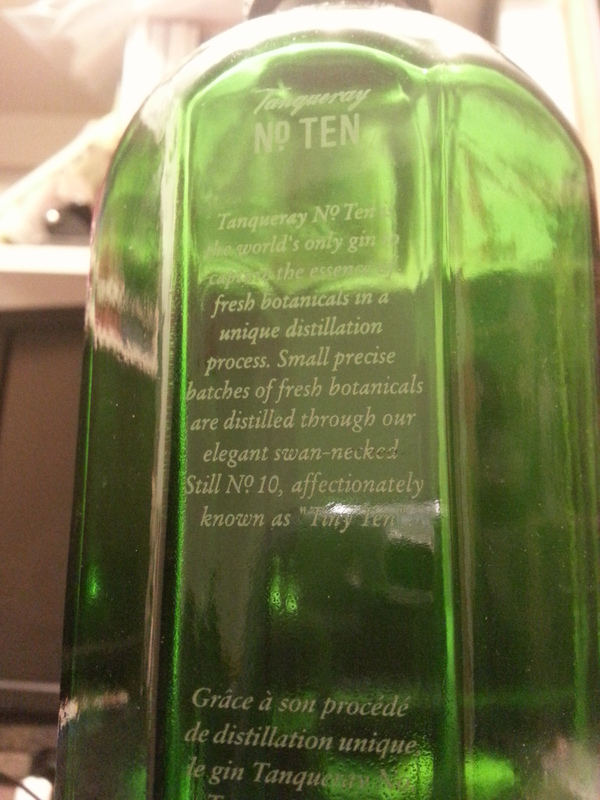 Still lovin’ the grapefruit citrus of Tanqueray No.10, lots of throat heat for the 47.3% ABV. Both achieve different goals: Tanqueray No.10 = grapefruit-lime-orange, Pink 47 = full flavoured juniper-citrus-rooty spice. Depends on what you prefer. Welcome to another round of the Gin VS battle, today, Round 4. Tanqueray 10 is known for have a more robust presence in cocktails due to its higher than usual ABV. Let’s duel! 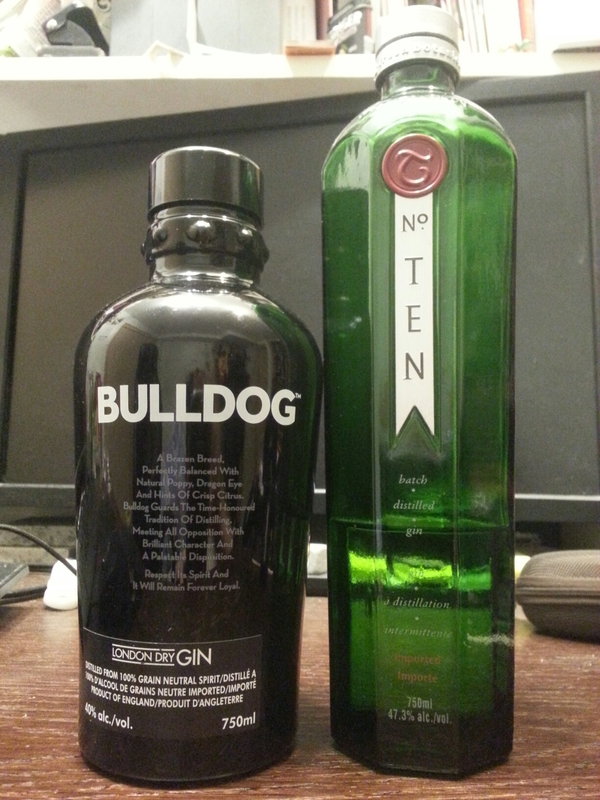 Nose: This time, Bulldog’s nosing includes a mix of juniper and citrus. The burn isn’t so bad, it comes after the initial bright flavours that come forward. In comparison, No.10 is much more juicy in its citrus profile, exhibiting lots of lime and grapefruit, as well as juniper. Nasal burn jumps out much sharper and right off the bat. Aromawise, No.10 wins hands down; it’s bolder and brighter. Taste & Texture: Bulldog starts of thick and sweet, juniper creeping up in the mids, finishing fruity yet spicy showcasing the longan. No.10 feels much thinner in comparison, but bursting with immediate assault of grapefruit peel oil mixed with milder orange and then lime oils in the exhale. Alcoholic heat and burn are apparent from the start but offset by the juicy citrus. Alcohol burn is much more apparent than the Bulldog as expected. No.10 has my vote, it grabs you attention from start to finish. 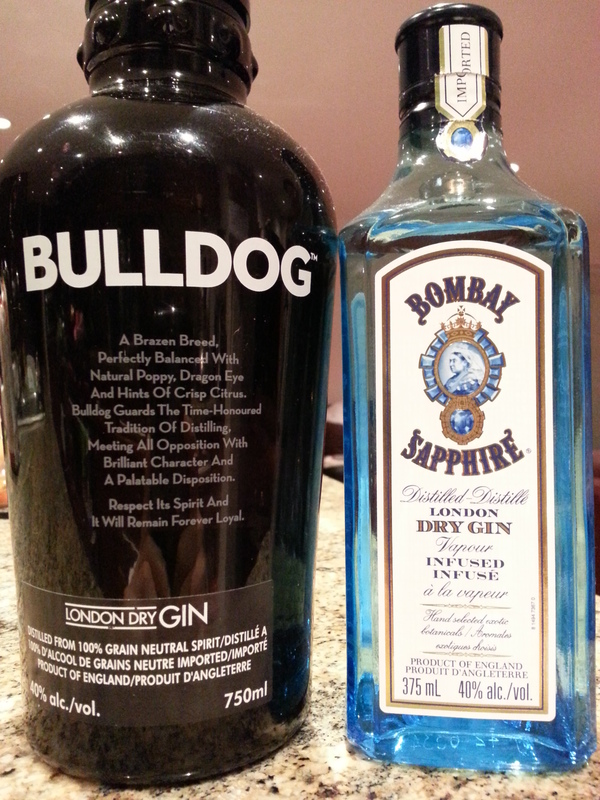 Although Bulldog is smoother as a sipper (but who sips gin? ), No.10 has that robust citrus flavour you just can’t ignore, albeit with a harsher alcohol burn. 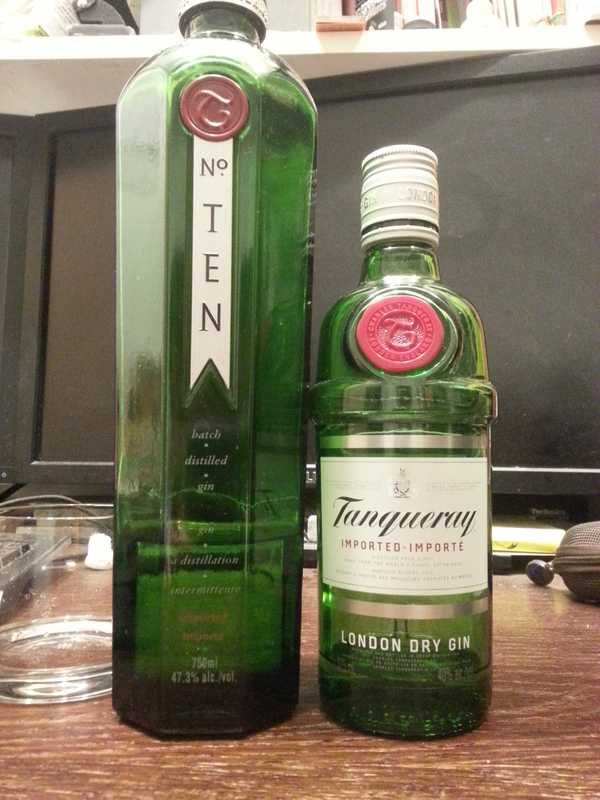 Extra: Tanqueray VS Tanqueray No.10: Normal Tanqueray is mellow in comparision. Juniper and pine flavours particularly stick out. No.10 is a lot more aggressive in flavour and heat, but the finish and flavour last much longer. No.10 all the way. 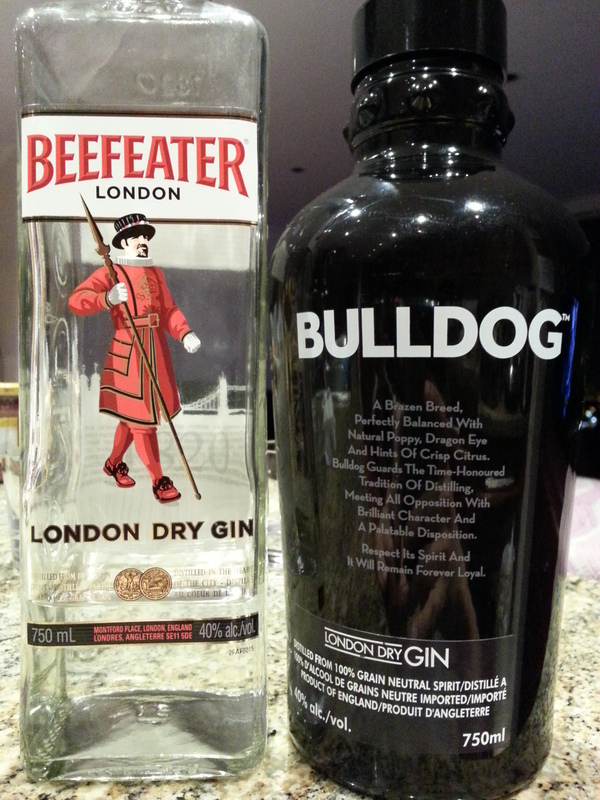 Also because No.10, Beefeater and Bulldog exist I’d stock them instead. Flavour is obtained by the “hanging basket” method where alcohol vapours pass through a mesh basket containing the 10 ingredients below. Such method supposedly gives a cleaner, crisper, more balanced taste as opposed to boiling the ingredients with the mash (according to the back label on the bottle). 10 botanicals from 7 countries: Italian juniper, German angelica root, Moroccan coriander seeds, Chinese liquorice, Spanish almonds, Italian orris root, Murcian lemon peel, Indo-China cassia bark, WEST AFRICAN GRAINS OF PARADISE, JAVA CUBEB BERRIES. Nose: To my surprise, even though I chose Bulldog as a winner last round, this time it comes across as overly harsh and sharp on the senses. It makes my nasal cavity tingle too much for my liking. In contrast, Bombay is noticeably softer yet dampened, with floral notes of lavender leading the way. The winner is Bombay Sapphire. Taste & Texture: Exotic fruit aromas of longan is nicely balanced with the lemon and florals in Bulldog. Furthermore, this elegance extends to the finish with soft, biting coriander and licorice. 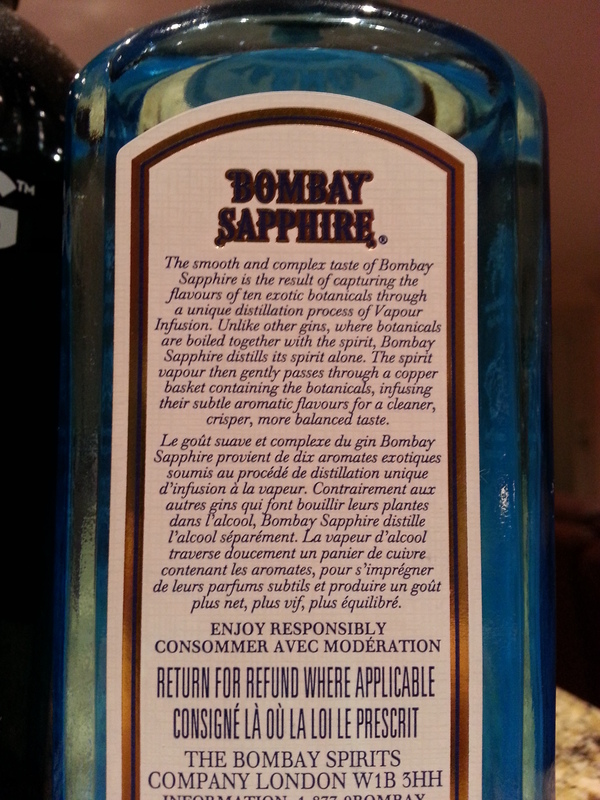 Bombay has a strange intial “grassy” quinine bitterness, transitioning into juniper and ending with massive amounts of peppery fire; This makes sense, attributable to the spicy qualities of grains of paradise and cubeb berries. In the end I prefer my gins to be first and foremost: balanced; secondly: exciting; and finally, floral. Based on these three criteria, I choose Bulldog. Bulldog is more balanced, more SIPPABLE but is more expensive. 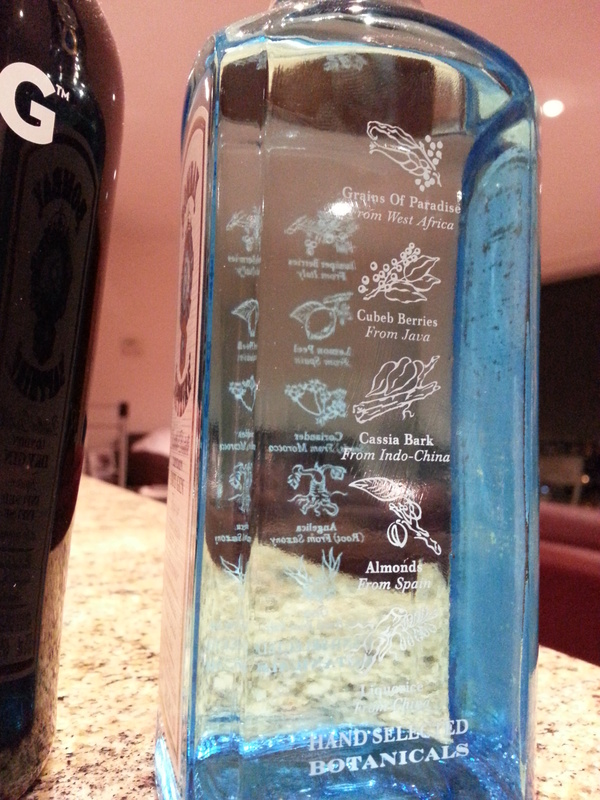 Bombay Sapphire has this initial grassy bitterness, and a MAJOR FIERY BACKEND. Yes, I WOULD stock Bombay Sapphire in my bar based on its unique spicy character, it certainly has its place in gin-based cocktails. 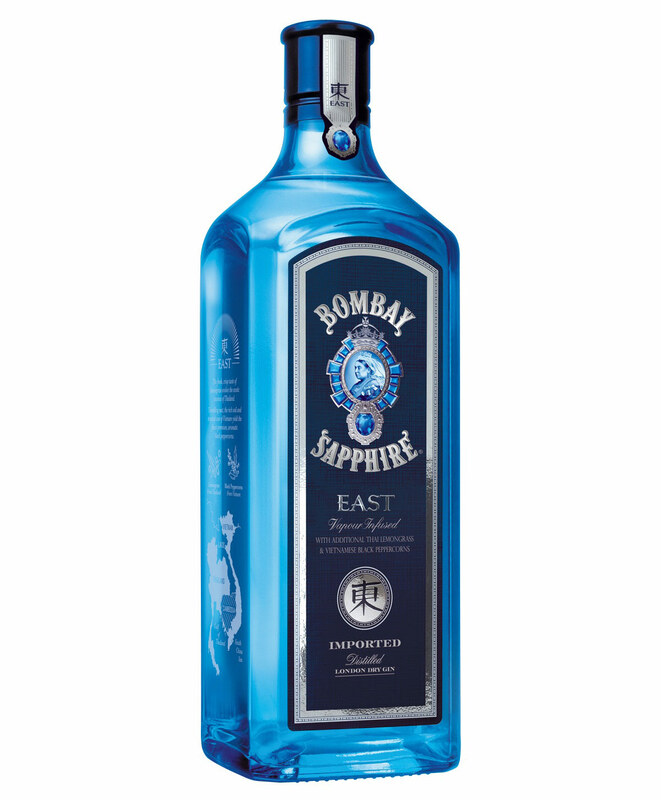 Used to be new but is now old News Flash: Bombay Sapphire East! It has two additional ingredients, Thai lemongrass and Vietnamese black peppercorns. I have a bottle that will be reviewed in the future. 9 botanicals: juniper, angelica root, angelica seeds, coriander seeds, licorice, almonds, orris root, SEVILLE ORANGES, and lemon peel. Awarded one double gold, two gold, two silver and two bronze medals from the San Francisco World Spirits Competition between 2006 and 2012. 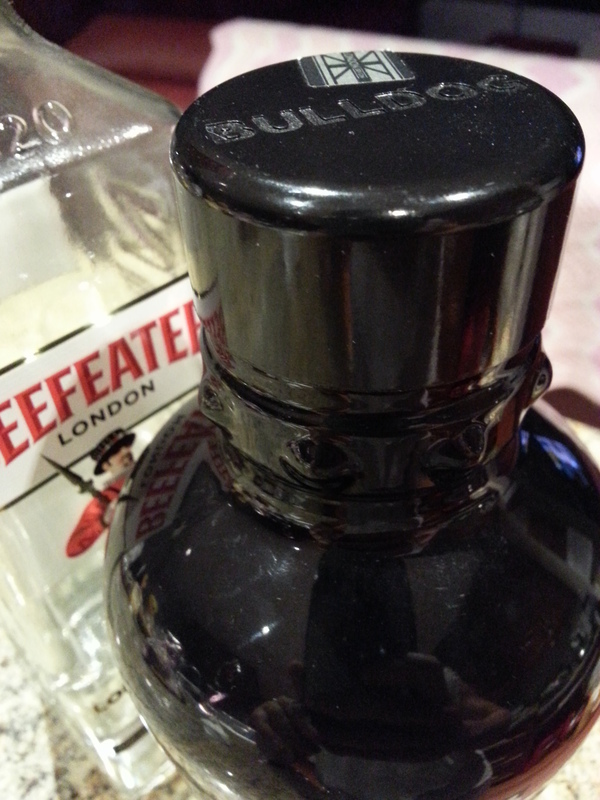 Nose: Nosing the Beefeater, it has strong, sharper juniper up front with very detectable tingly alcohol followed by nasal burn. Bulldog exhibits less juniper and more of a softer, creamy, almond, nuttier scent. It’s almost milky in fact, like orgeat. The alcohol detection of Bulldog is less pronounced. 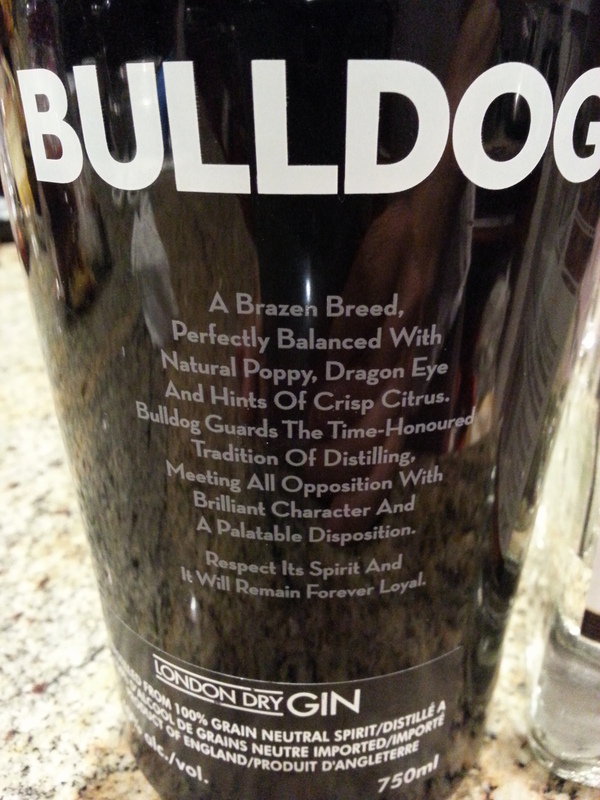 Based on aromatic smoothness, I pick Bulldog. Taste & Texture: (Since I’ve already cheated and know of the ingredients beforehand, I’m subconsciously looking for said ingredients in each respective gin. Anyhow, let’s get on with it.) Beefeater drinks very citrusy and sweet (5/10) up front, juniper in the mids, light spicy bitter coriander/licorice in the finish. Alcohol burn is there but manageable due to the intense orange and lemon aromas. Bulldog drinks slightly thicker, more tea-like (lotus leaf), less juniper, but definitely way spicier with more licorice and roundness in warmth in the backend. I actually feel both are winners in that they are both balanced, distinct in flavour profile, and easily drinkable. But if I could only chose one, I would choose Bulldog due to the fact it incorporates exotic ingredients that tickle my palate. 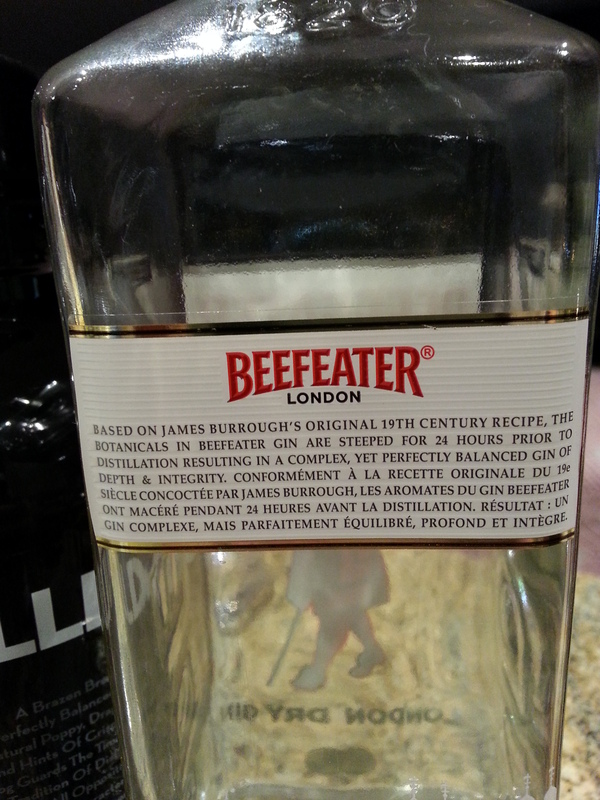 Beefeater is all about CITRUS (ORANGE/LEMON), and has a fuller body. 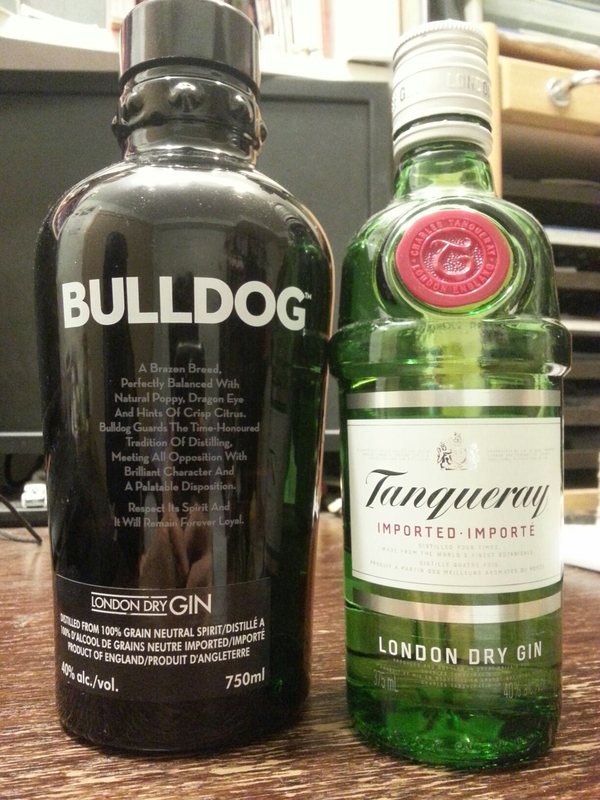 Bulldog is slightly smoother, MORE COMPLEX and has more enticing ingredients.